Organic Citrus Dill seeds perfected for indoor growing. 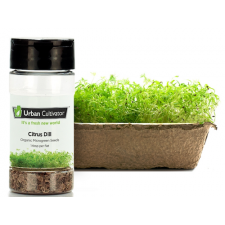 Grows four flats of Citrus Dill microgreens. This annual herb grows up to a height of about three feet and has feathery green leaves called dill weed, marketed in both fresh and dried forms. The distinctive flavor of fresh dill weed in no way translates to its dried form. Fresh dill does, however, quickly lose its fragrance during heating, so should be added toward the end of the cooking time. Dill weed is used to flavor many dishes such as salads, vegetables, meats, and sauces.